OTTAWA - With a handful of games left on their regular season schedule, Fury FC braved hell and high water - almost literally, with hurricane Florence battering the Eastern coastline of the Carolinas - and made the trip down to Richmond, Virginia to face the Kickers on Saturday night. Another complete performance by the Ottawa side on a windy night had Fury FC grabbing a crucial 2-0 road win. Making the most of his full week of preparation, Head Coach Nikola Popovic came into the match with one more trick up his sleeve, opting to start Captain Carl Haworth at right-back, moving Eddie Edward to the left in the absence of Onua Obasi; the new configuration had shown great promise in practice and could lead to more creativity and service on top. 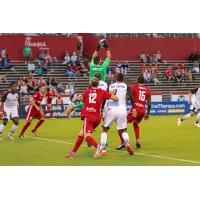 It also marked the return of Maxime Crépeau in front of goal, the keeper having missed Fury FC's last match while away with Canada's Men's National Team for the Concacaf Nations League qualifying. Canadian content was once more in full display, Ottawa's starting formation featuring eight high-calibre Canadians. Ottawa opened the score in the 10th minute following a good run by Taylor, finding Haworth on the overlap on the right, who looked to cross it back towards Taylor, but the ball was deflected in the back of the net by Kickers Roberts. In the 38th minute, Captain Haworth was at it again. On Fury FC's first corner kick of the night, Haworth curled his right-footed attempt around the front post, out of reach of Richmond's keeper Barnes, bringing Ottawa's lead to 2-0. Fury FC came close to adding a third one before the end of the frame when Reid blitzed past his defender and found Dos Santos coming forward on the other side of the box. Dos Santos' out-of-balance shot hit the crossbar and Fury FC would remain up 2 going into halftime. Ottawa picked up where it left off at the start of the second period, and Eddie Edward narrowly missed a solid right-footed strike from the top left corner of the Kickers box but was forced to watch his shot float just wide of the far post. If the Kickers threatened at time coming through the middle, Fury FC have offered yet another strong defensive performance, highlighted by the tireless work of their centre-backs Attakora and Meilleur-Giguère. Dos Santos and Reid connected again in the 74th minute, and after a beautifully weighted ball by Dos Santos, the finishing touch by the Canadian Reid was deflected by Richmond's keeper, earning Ottawa a corner kick that would ultimately be cleared by the Kickers. Fury FC kept their compact form throughout and secured the valuable three points on the road, closing the night with a 2-0 win over the Kickers, temporarily sitting in the 7th position in the Eastern Conference. Fury FC will have another full week of training at home before facing a formidable foe in Louisville on Saturday, September 22, looking to continue their push towards a USL playoff spot. With his Olimpico goal, Carl Haworth becomes co-leader as all-time, all-competitions goal scorer, tying Steevan Dos Santos with his 16th goal in Fury FC uniform. With a 13th clean sheet this season, Maxime Crépeau is only 1 away from trying the Fury FC record of 14 in a regular season set by Romuald Peiser in 2015. With his 12th win of the season, Head Coach Nikola Popovic establishes a new winning record for a Fury FC head coach in his first season with the club. On the team's performance... "We came in very well. The team was very focused in the early minutes of the game. Naturally, we created good chances. The team was very well organised, very compact, aggressive, the chances were coming and we were able to maintain a good efficacy and finish on those chances. It was a very consistent game from our team, we showed good organisation and very good character." On the team's mindset going forward... "Now we are collecting the points. I always said, even in performances we were not able to score, that the team was playing well and creating chances, which is the most important sign. The team was getting consistent in terms of producing chances. And of course, being able to have to normal weeks of training is a big difference. As a coach, I believe in training, I believe in practice, and I believe that if you practice well, you will be able to perform in a better way."